Freelance science writer Roberta Kwok, a 2008 SciCom graduate, has won the 2010 Walter Sullivan Award for Excellence in Science Journalism—Features from the American Geophysical Union. 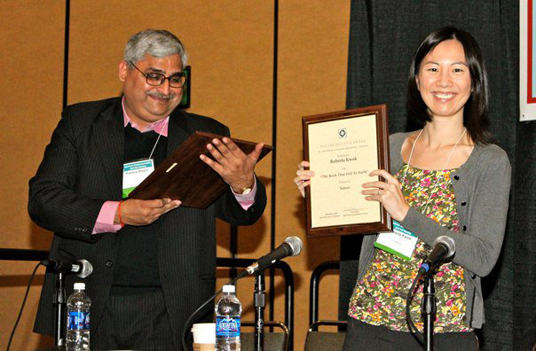 Kwok received the award on December 15 at AGU's Fall Meeting in San Francisco. Also recognized was Pallava Bagla, India-based correspondent for Science, who won AGU's David Perlman Award for Excellence in Science Journalism—News. Each award consists of a plaque and a $2,000 stipend. Kwok won the award for "The Rock That Fell to Earth," a feature she wrote for the March 25, 2009 issue of Nature during an internship after the SciCom program. The story traces the fate of an asteroid spotted by astronomers just 19 hours before it collided with Earth and exploded in fragments high over a desert in Sudan. Planetary scientists later collected some of the black chunks. The Sullivan Award recognizes work published with lead time of more than one week. Regarding Kwok's article, the selection committee commended that it "explains how studying asteroids might provide clues about how many planets, including our own, may have formed. . . It makes AGU science extremely accessible, even fun, and is the kind of article that would encourage the interest of young men and women toward studying fields that AGU supports. Kwok did a wonderful job of weaving in scientific detail, with a fast-paced and thrilling tale of an unusual opportunity in planetary science. The event itself was remarkable and her chronicling of the tale was equally as unique." Furthermore, the committee noted that "Kwok is a young journalist and was just an intern at Nature when she wrote the piece, impressing judges with the maturity of her work and her potential to become one of our leading science writers." Kwok earned her B.S. in biological sciences from Stanford University and her M.F.A. in creative writing from Indiana University before attending the Science Communication Program. She completed internships at the Idaho National Laboratory and Nature, and she now writes from the San Francisco Bay Area for national magazines. She also worked as the "Journal Watch" reporter for Conservation.